The New Vineyards Luxury Motor Coach RV Resort features lots including a Motor Coach pad and Casita. Renters are able to lease the pad only, as the Casitas are not resales, most have not been lived in at all, and the lots are for sale with a realtor. The pad rental gives a potential buyer the opportunity to stay at the resort and in essence try-before-you buy. Rental lengths are 30 day minimum. Phase I is complete for Class A Motor Coaches only, no exceptions. Monthly Pad Rentals to March 31st, 2019 are $1,350. No rentals for next season (October 2019-April 2020) will be taken before June 1st, 2019. INCLUDES: FULL HOOK-UPS (WATER, 50 AMP POWER and SEWER) access to fitness rooms, two pools, two spas, common area bbq's and tennis courts (pickle ball Monday, Wednesday, Friday mornings). Trash & Recycle on site. No laundry facilities. Rules of the Resort are located on the FAQ tab near bottom. CONTACT US for availability. Please include names of guests, mailing address, cell phone number - year ,make, length of coach - arrival and departure dates. Pets are welcome, please include details. Please note business hours are 8:30 - 4:30 Monday to Friday, Saturday 10-2. Inquiries outside those times will be addressed the next business day. Upon securing a reservation, a rental agreement will be emailed for signature, funds can be e-transferred, mailed or delivered by cheque or money order. $500 deposit is required at time of reservation. 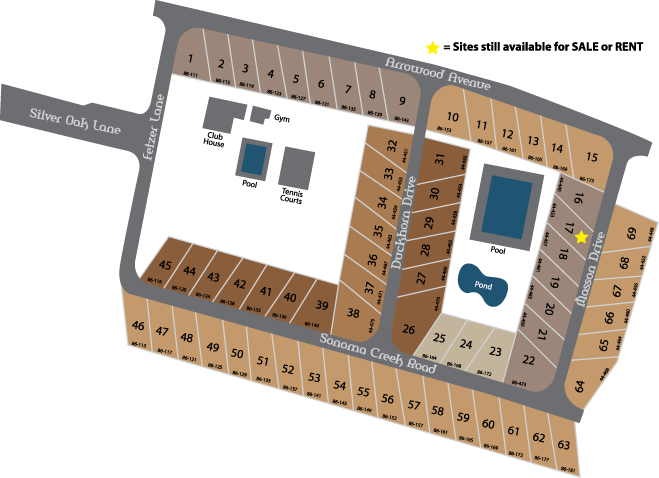 A map of all sites for rental is pictured below, we will do our best to accomodate preferences, ultimately it is first come, first served.